Alfie finding the first Alpine strawberries of the year. Protected growing spaces are great for Irish rainy days. Another day in the big tunnel Alfie continues to play in the middle of the plants, A few lettuces have been flattened and I am not complaining as I get to play too, weeding and planting. (Where play = love what I do). There was a lot of thinning required this year on all the indoor fruit trees. While I was thinning the nectarine Alfie was busy shovelling soil. Tivon helped to thin the Nectarine too, although he soon decided he would do something else! 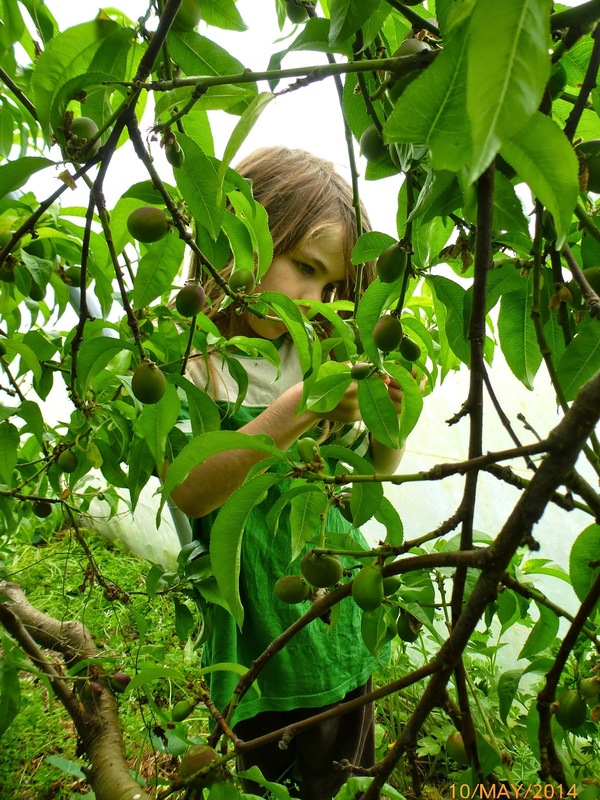 Alfie took a photo of me thinning the Apricot. Alfie playing in the small tunnel. I put some left over builders sand into a couple of old tyres to store it, I use a little sometimes while potting plants. Alfie has most of it on the path where it is scooped, loaded and dumped, meanwhile I am able catch up with potting on vegetable seedlings.